A beautiful, sunny day. Breakfast consisted of two out-of-date porridge pots that I convinced the YHA warden to give me for free. Suncream applied, I set off quite early as I had a long day ahead. 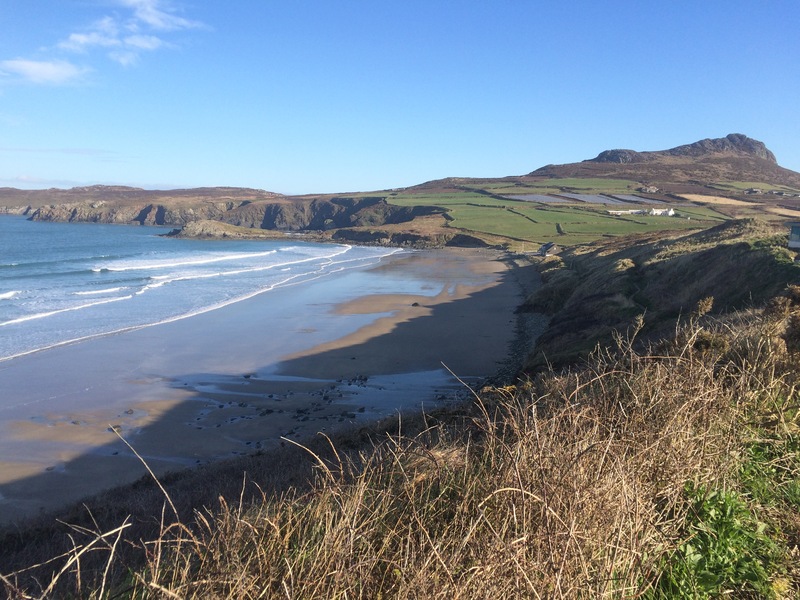 Whitesands Bay looked beautiful and empty. Ramsey Sound is visibly fast-flowing and looks treacherous for canoeists. 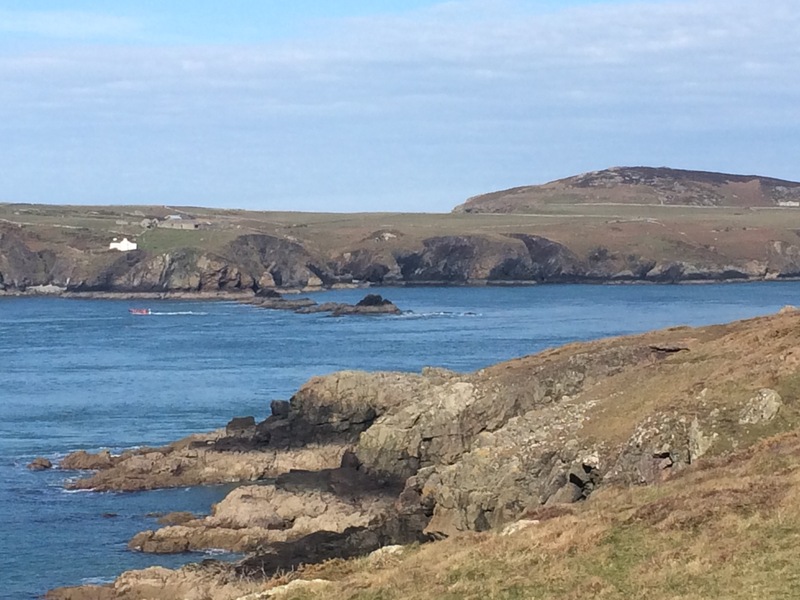 As I passed St Justinian lifeboat station people were arriving for boat trips to Ramsey Island. 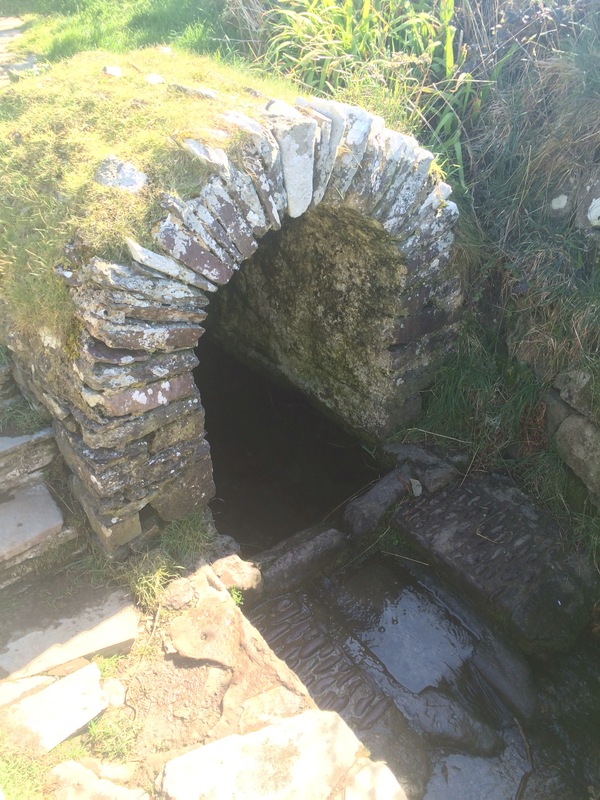 The path was diverted around the building site created to service the building of a new lifeboat station. 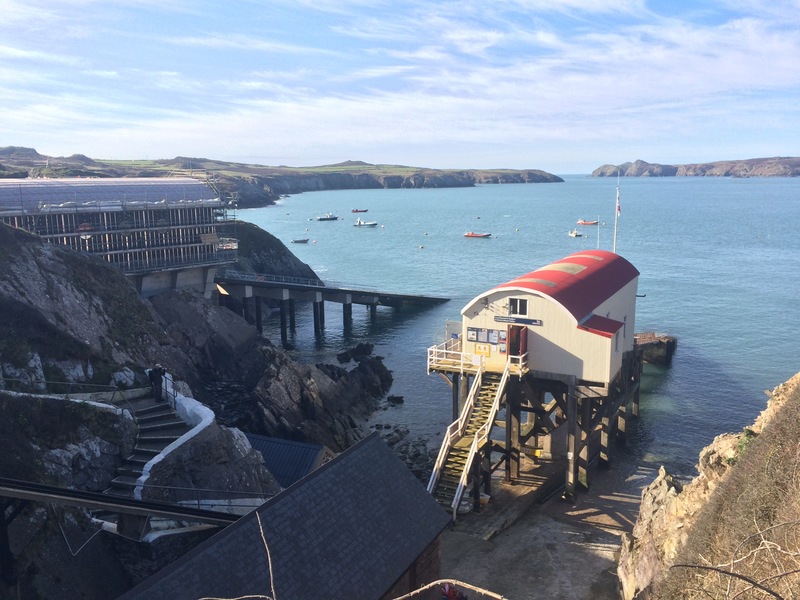 St Justinian now has two lifeboat stations! 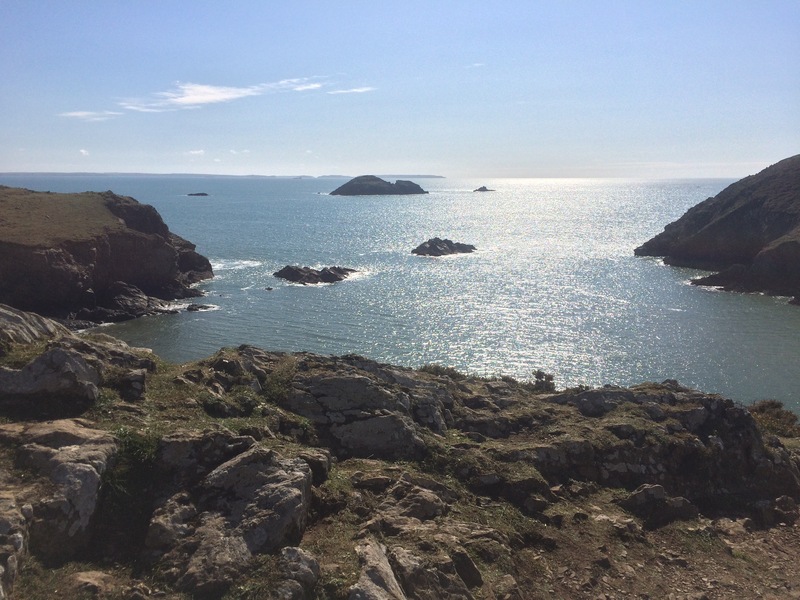 I rounded the headland that marked the start of St Bride’s Bay and made good time to Porth Clais. After only stale porridge and green for breakfast I couldn’t believe my luck to stumble upon a tea shack in Porth Clais. I enjoyed tea, homemade cake and a conversation with the person serving and a family. 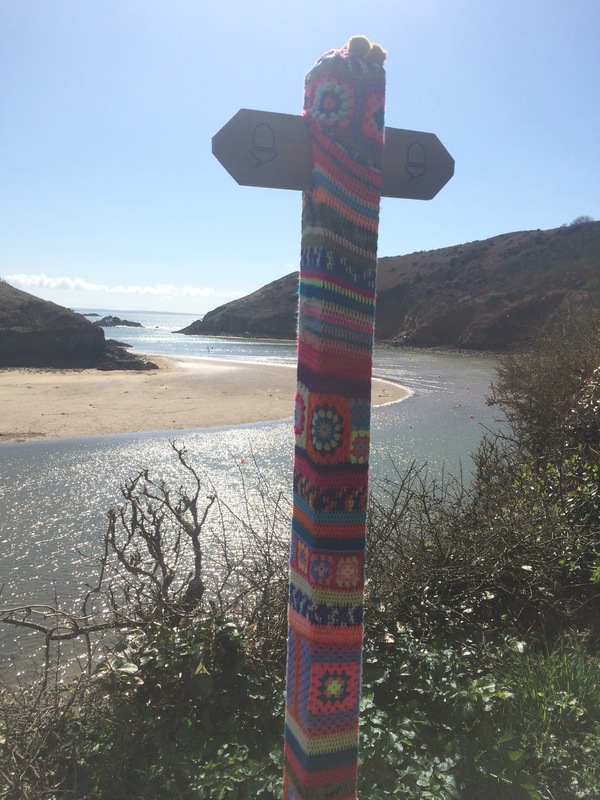 On to Solva via St Non’s ruined chapel and the beautiful Caerfai Bay. 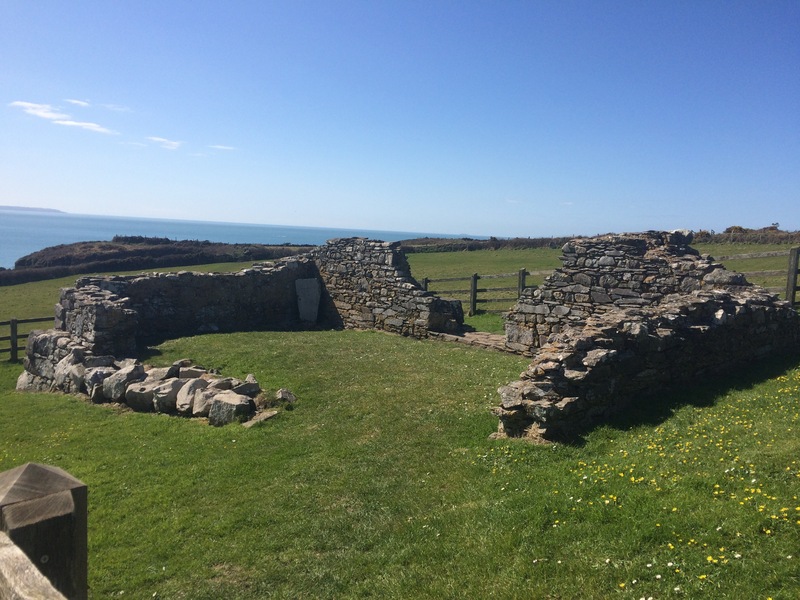 A chapel was built on the cliff at the spot where, according to tradition, St Non gave birth to St David in the 6th Century. Seemingly there was a thunderstorm at the time of the birth and a well sprang up that apparently cures all infirmities. Here I bumped into Jack and Deja again. 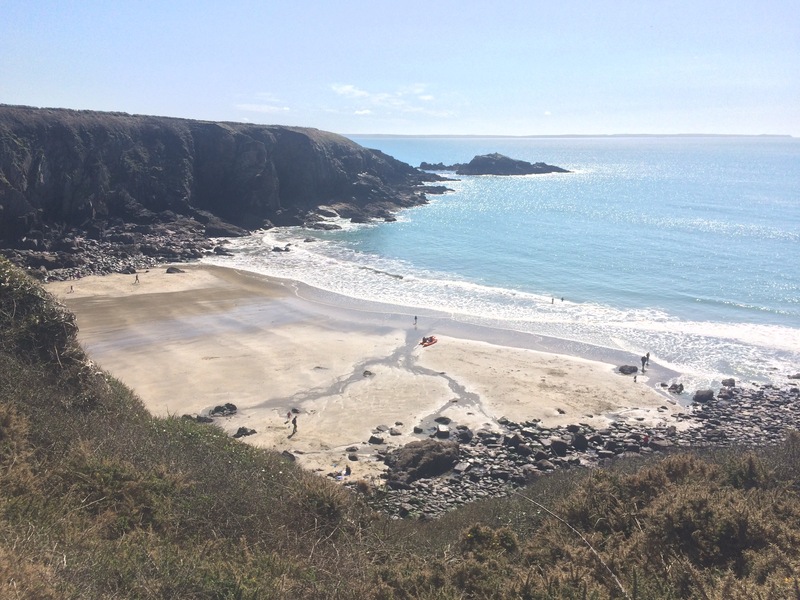 They had wild camped outside St David’s, having diverted there to shop for food, and we’re just hitting the coast again at St Non’s. 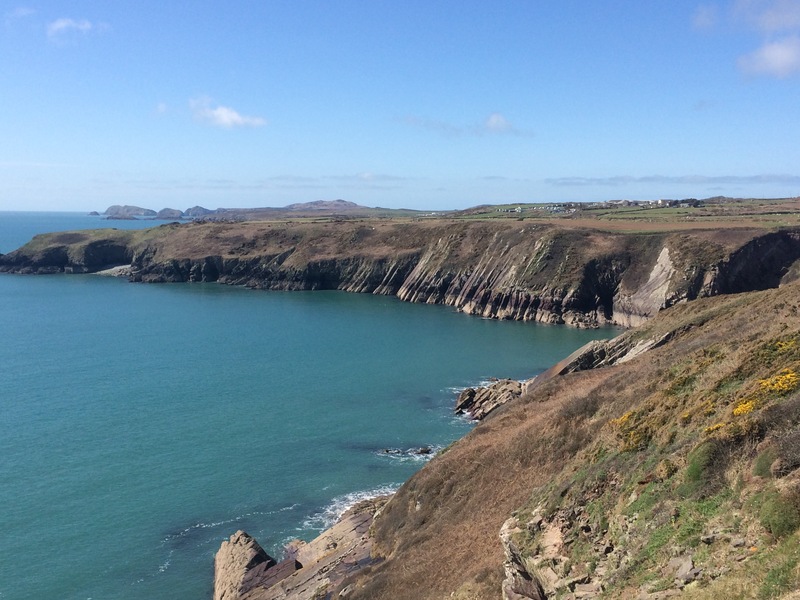 The views were stunning in the sunshine and some of the cliffs were pretty impressive too. 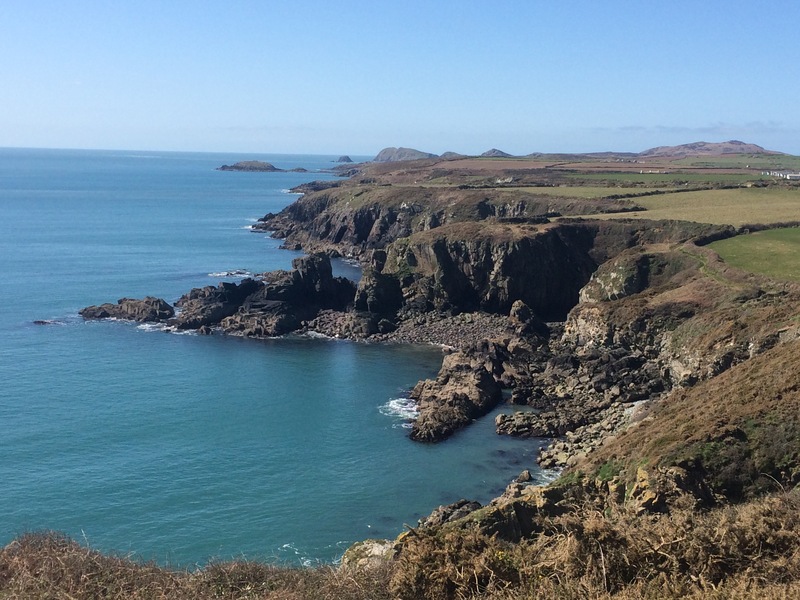 Just before I arrived at Solva I met a couple who were staying at the St David’s youth hostel. They had caught the bus to Newgale and were walking back. I was making good time. 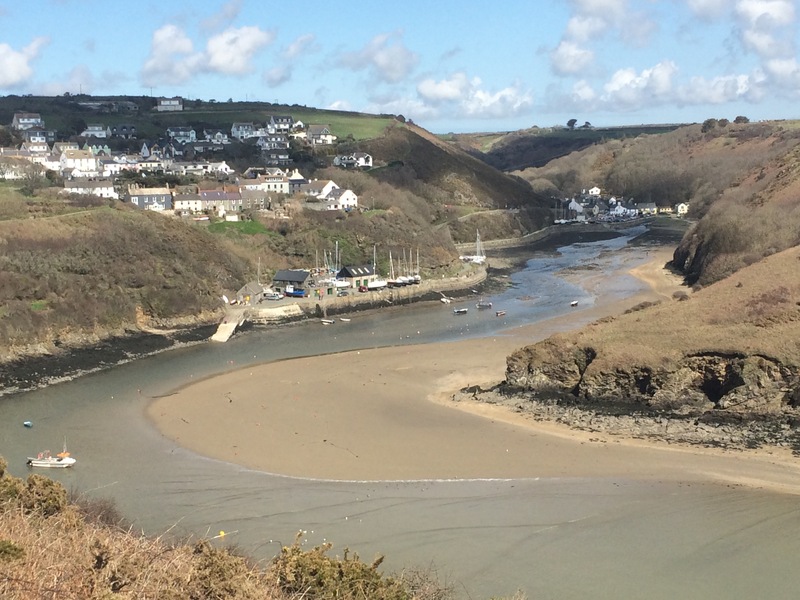 The Solva inlet was formed by ice age glaciers and makes a great natural harbour. I stopped at the Cafe on the Quay for coffee and a sandwich. It was hot today and, despite the suncream, I was burning. 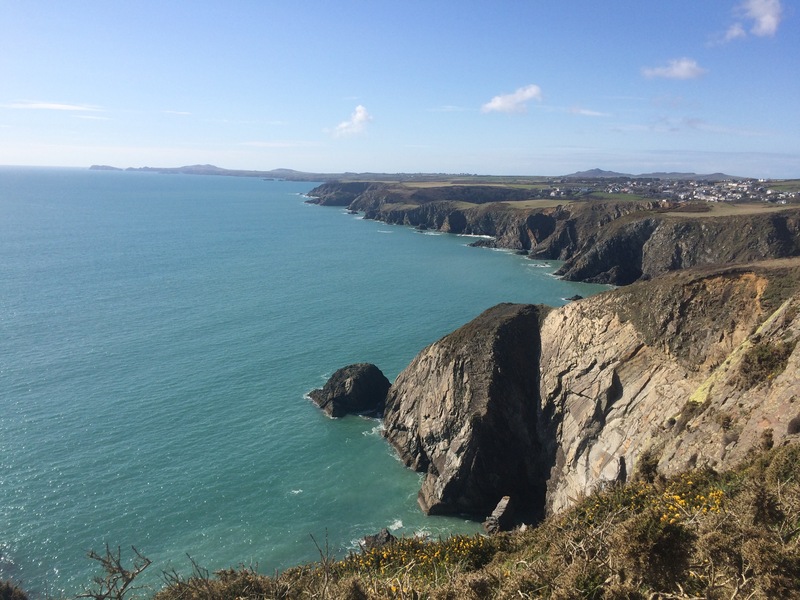 The Gribin ridge line overlooking Solva was the site of an Iron Age fort and it does indeed have commanding views all around. The last section seemed very hilly and I was sweating up the steep cliffs. 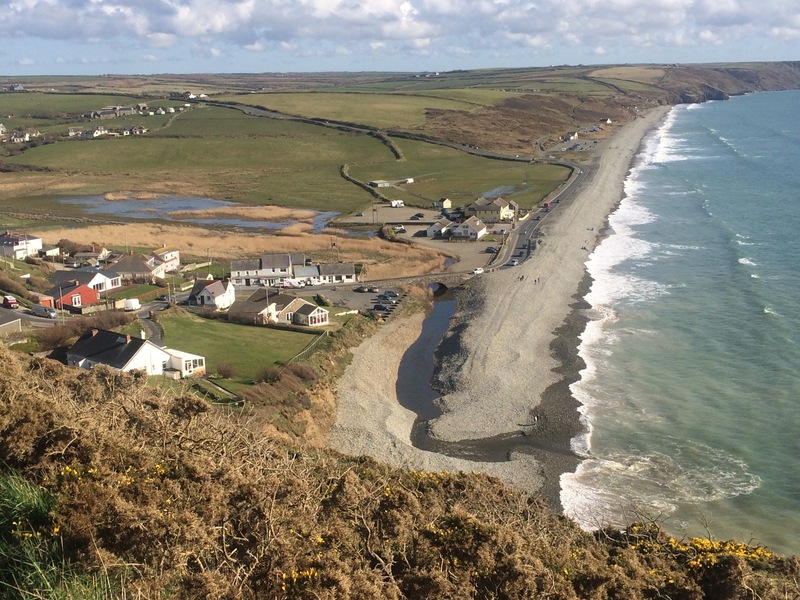 Finally I looked down at Newgale Sands and picked out the beachside campsite, which looked empty and flooded. 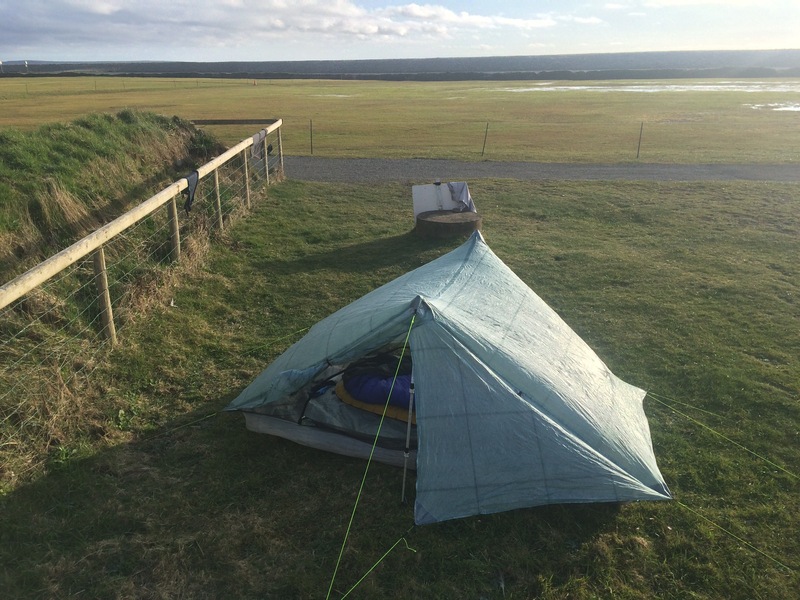 I should have phoned ahead – the campsite was indeed closed due to flooding. It was 5 pm and I wasn’t going anywhere else. I phoned the owner (hoping they might open the toilet block) and she said that the night toilet (never come across one of those before) was open so I could use it. I found a dry spot and pitched my tent. Not fancying the idea of remaining sweaty for my first camping experience of 2016 I had a strip wash in the toilet and washed my hair under the outside tap (I am definitely a clean freak). I even washed my smalls; I do this every night so why make an exception? It was so windy they virtually dried before I headed to the next door pub for dinner. Jack and Deja had just arrived at the pub and so I sat with them and we swapped tales. They pitched next to me so at least I wasn’t on my own (the site owner had been concerned about that when I phoned her – I was more concerned about not getting a shower!). All in all it had been a lovely day. How on earth do you manage to blog out there?! Amazing snaps and it sounds like an incredible journey!